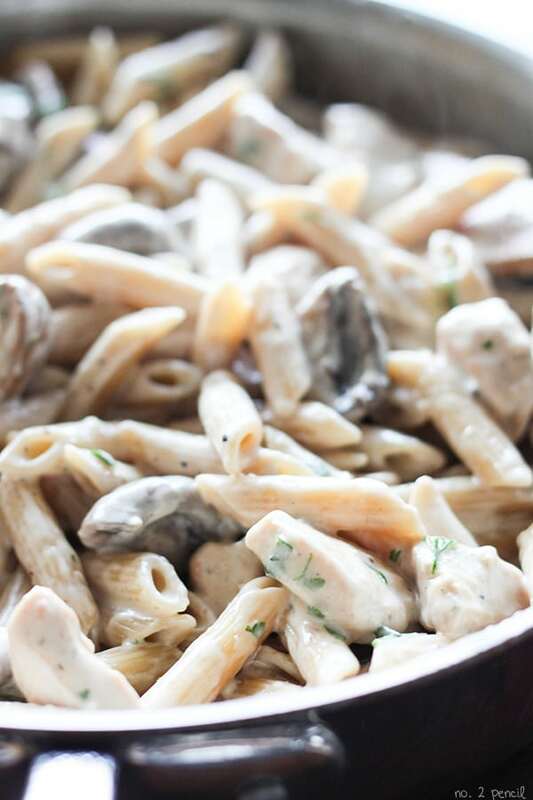 I’m so excited to share this One-Pot Portobello Mushroom Chicken Alfredo. 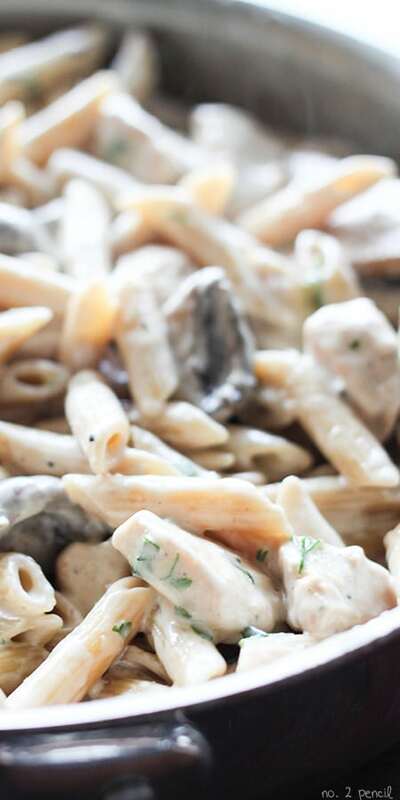 Meaty baby portobello mushrooms and tender chunks of chicken simmered in a rich homemade alfredo sauce. Everything cooks in the same pot, even the pasta. This is a one-pot meal that is so quick it can be whipped up on a busy week night, but so special that it can be served to company at a dinner party. 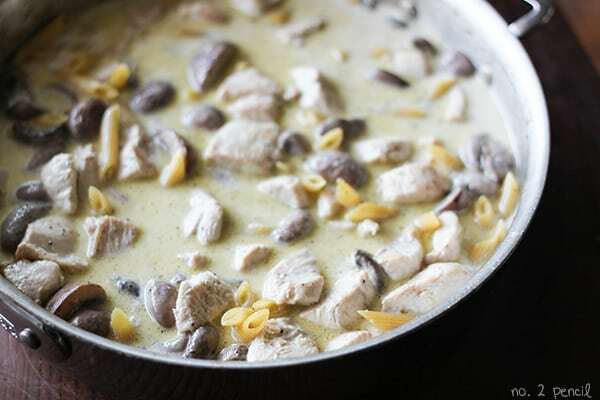 I adapted this recipe from my popular one-pan chicken alfredo. It’s one of our family’s favorite recipes and this variation might be even better. 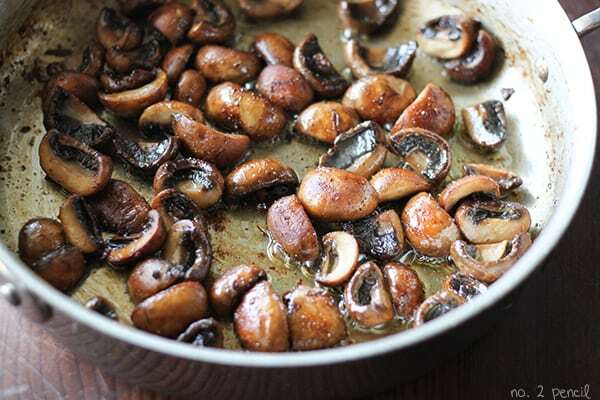 I used baby portobello mushrooms, also known as cremini mushrooms or baby bellas. White mushrooms or full-sized portobellos will work in this recipe too. If you are looking for more one-pot dinners, all my one-pot recipes can be found here. Start by browning chicken in a large sauté pan. Use a medium high heat to put some color on the chicken. This step will only take a few minutes as the chicken doesn’t need to be cooked through at this point, just browned. 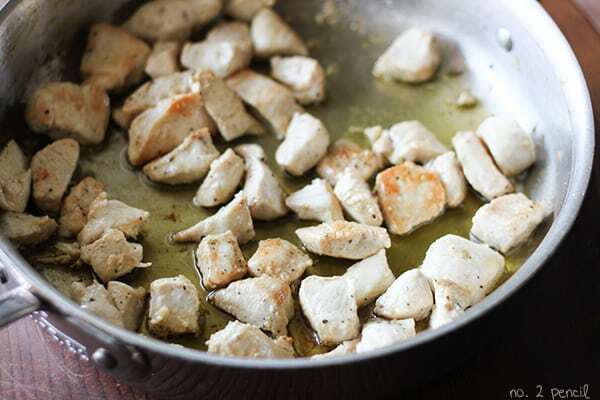 Remove chicken from the pan, add two tablespoon of butter and sauté mushrooms. Season mushrooms with salt and pepper and add minced garlic to the pan. Cook another minute or two, just until garlic has started to soften. At this point, I could not resist stealing a few mushrooms from the pan. 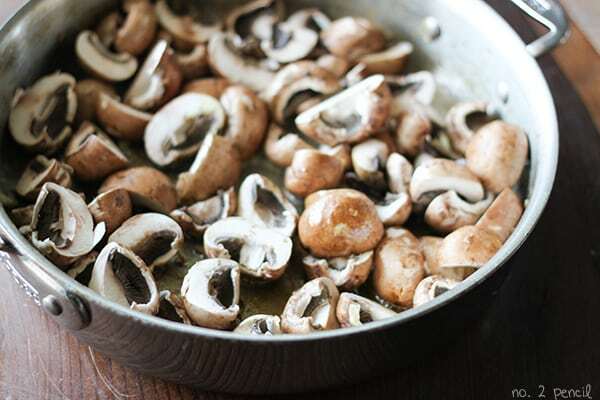 Sautéed mushrooms are pretty hard to resist. Pour in chicken broth and use to deglaze the pan by scraping up the brown bits from the pan. Since you are using a pretty hot pan to cook the mushroom, the broth should start simmering immediately. Add browned chicken, heavy cream and uncooked pasta to the pan. Once the entire mixture is simmering, reduce heat to low and cook covered for 15-18 minutes, just until pasta is tender. Remove pan from heat and stir in freshly shredded parmesan cheese and top with parsley. In a large sauté pan over medium high heat, brown chicken pieces in olive oil. Stir in, browned chicken, heavy cream and uncooked pasta. Love this idea, I bet the pasta must have the most incredible flavor after cooking in that creamy mushroom sauce! I would like to make this for a family gathering but would have to double the recipe. Would I just double all the items? Yes! That should work out just fine. Let me know how it goes! YUM! 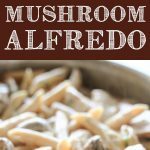 Too funny because I’m making a one-pot alfredo tonight for dinner! 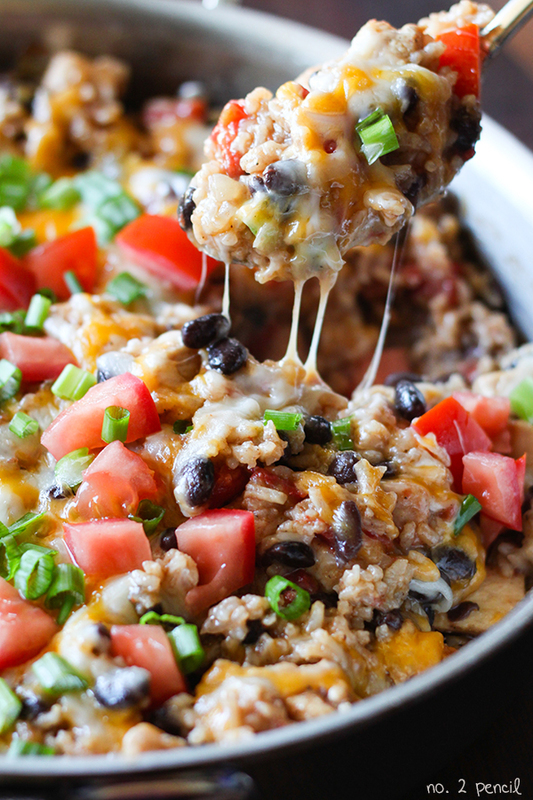 This looks great–love the idea of adding chicken into the pan too! I need more one pot meals in my life! I’ve gotta try this one! Hello! I was cooking it and the sauce totally liquified… Looks like oil now. Did I cook it too long? The sauce won’t thicken until after the pasta cooks and you stir in the parmesan cheese. I hope that helps! 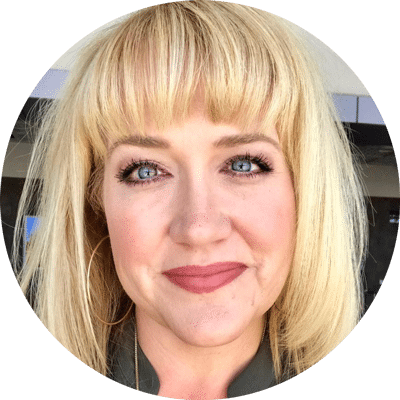 Send me a direct email at melissa.pencil@gmail.com if you need help! This looks delicious! I’d love to make it but I don’t see the recipe, where is it at? Thanks! Sorry, my website had a little hiccup last night. The recipe is visible again. Thanks for letting me know! Made this tonight but without the chicken, and added spinach. Super easy, fast and tasty. Definitely will make again. Sounds so good! Thank you!